If you have recently started up a website, online reputation management may be new to you. Your website may have an excellent design filled with amazing content. You may even have invested in good SEO to get a high rank. However, such processes will not be enough. If you want your website to be prominent in your niche, you need online reputation management. As the use of social media networks rise, your business needs to have profiles in those channels. Additionally, it has become essential to maintain a blog. All of them will help you remain at the forefront of your niche. Unfortunately, in order to leverage the potential of these tools, your business will become filled with a whole gallery of responsibilities. They must be taken care of in order to maintain the power of your brand. While social media channels are great tools for marketing, they can end up becoming a destructive force if your profiles are not carefully managed. On the other hand, it can be difficult to maintain the various accounts especially if your business is a small one. Of course, you can easily outsource these functions to management services that specialize in online reputation. How Can These Companies Help? An online reputation management agency can help your company optimize its growth potential by various means. The fact is that the consumers of today will first make an online research before purchasing a service or product. If the potential customers find extensive negative reviews about your business, they will never try out your services. Social media sites, discussion boards and review forums have become a place where consumers interact and give reviews on businesses. Negative remarks can breed quickly here. Online reputation management can help your company by keeping track of such comments. Additionally, they will make sure that positive reviews of your company are more visible than the negative ones. In order to improve the visibility of your company, your website needs to reach the first page of search engines. Online reputation management makes it easier to get that high spot. 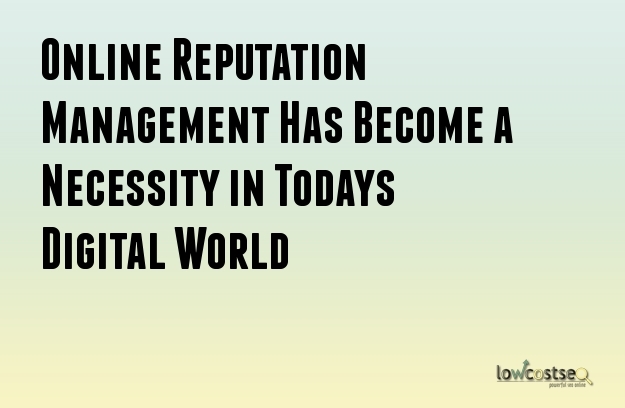 Management services will maintain your reputation online regularly. This means your company keeps control of its position on the first page which in turn is more likely to bring in clients. These services can help you launch and manage social media campaigns for your company more effectively. Possibly the biggest benefit you can get while working with an online reputation management agency is the ability to control how your customers view your business. These agencies can ensure that positive information is posted for your company on the various forums, social media networks and search engines. This means, your customers will view your company with trust and worth doing business with. Online reputation management services will ensure that the image of your company is constant through the internet. Moreover, many of these agencies also offer SEO services which mean it is easier for you to get that elusive first spot on search engines.